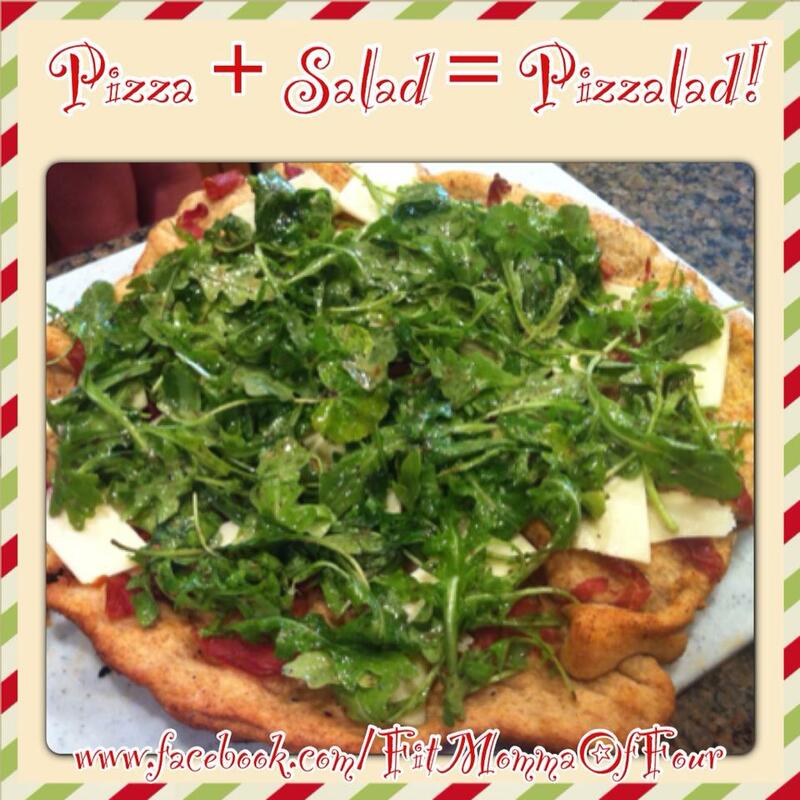 Fit Momma of Four: Pizza + salad = Pizzalad! I was inspired by a group of recipes in the latest issue of Eating Well magazine to create this tasty dinner treat... Pizzalad! Crust- dissolve 1 tsp. quick rise yeast & 1 tsp. sugar in 2/3 cup lukewarm water. Stir in 1 1/4 unbleached all purpose flour, 3/4 whole wheat flour, & 1/2 tsp. sea salt. Knead on a lightly floured surface for approx. 10 mins. Place in an oiled bowl & turn to coat. Cover the bowl with a clean towel, place in a warm spot, & allow to rise for approx. 1 hour, until doubled in size. Place oven rack in the bottom third. Place pizza stone on the rack. Preheat to 500 for 20 mins. Roll out dough on a lightly floured surface (12-14 inches). Top with 1 Tbls. olive oil, garlic powder/ fresh pressed garlic, fresh ground black pepper, & a dash of red pepper flakes. Tear 4 slices of Proshotto & sprinkle on top. Place on a pizza board or the back of a cookie sheet for transfer to the pizza stone. *Combine in a shaker 1/2 cup red wine vinegar, 1/4 cup canola oil, sea salt, garlic powder, fresh ground black pepper, dried oregano & basil. Shake well.